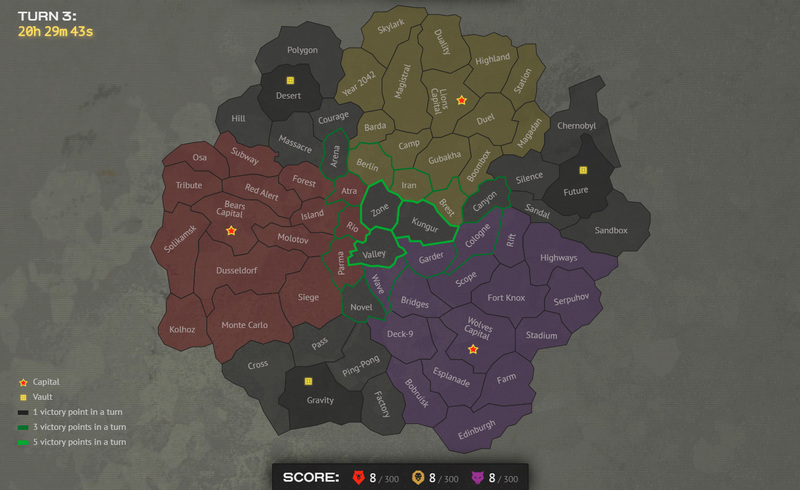 All 3 factions continue their expansion in all directions. Bears, Wolves and Lions have captured the surrounding territories, good job! Wolves have captured Edinburgh, Bobruisk, Deck-9, Wave, Garder, Cologne, Rift, Highways and Serpuhov. First 2 turns of the War were peaceful — factions expanded their territories by capturing neutral regions. At this moment all factions have the equal number of Victory Points — 8. But in the third turn the situation can change completely — the first conflicts can already be seen on the War map as factions approach each other’s borders and will likely want to strike at the free real estate of the enemy territory. Also, soon the most profitable territories of the central region will be fought for, and then can earn the most number of Victory Points. This time the active participation of faction players will play a key role in the War. Who will become the first leader? Join the War, earn stars (but don’t forget to vote and confirm your choice on the War site first), discuss victory strategies in the united War Room and lead your faction to Victory!